The cat "Humbug" banner sits on the table, as unfinished as it was at the beginning of the month. Granted, I have not felt like myself and the thought of dragging out the sewing machine to finish the project didn't appeal. But I feel drawn to that red corduroy with the cats on it, the one I was going to turn into a jacket. While in the basement doing a load of wash, I looked through the drawer which contains my patterns. I don't see the pattern I used for the original red corduroy coat but I did find the pattern I was going to use for the cat corduroy. 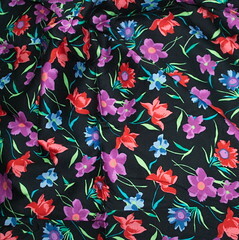 I was drawn to the pattern because it was shown in a cat print. It's nice...but...I...think I want to look at other patterns for something closer to the original red coat. That's my feeling, right now. Ask me again in a month if I feel the same way. 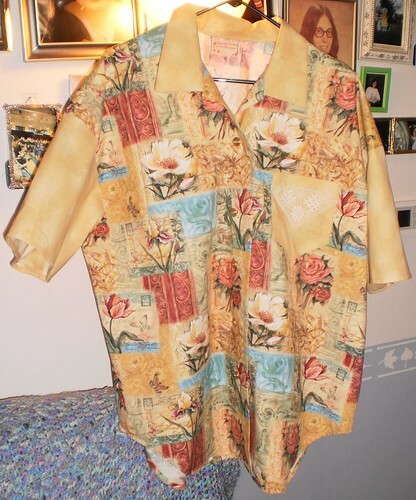 While looking for the original coat pattern, I found the pattern I used to make shirts for Carole and David for Christmas. They are referred to as "camp shirts", probably because the style is synonymous with summer camp personnel before knits were widespread. I realized, some time after Christmas, that I had never posted photos of the finished products. 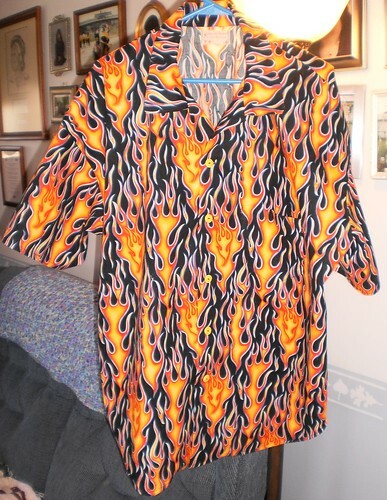 This is Carole's shirt. They assemble easily and are easy to wear and care for. I made one many, many years ago for my ex. 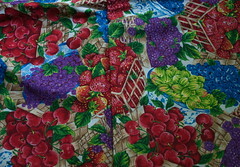 It's a loud print of food and was made for a picnic. I think he wore it once or twice before I commandeered it and have worn it ever since. I'm drawn to loud and bright. As I was working through the boxes of fabric, more hunks appeared for which I have no memory of why I bought them. I separated swatches into piles based on fabric type and it occurred to me that these would, perhaps, make good camp shirts. I add to this the cats printed on the light weight cotton shown before and I'd have a whole week's worth of new shirts. It would just take the time, buttons and interfacing to make them. 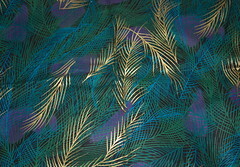 I would probably have to buy complimentary fabrics to make a shirt similar to Carole's if I use the "peacock" feather blue but there's more than enough of the flowers on black to make a shirt, even a long-sleeved version, although that might be a bit much. I've stood in my closet on some days wishing I had the funds to buy some different shirts, recycle what I have and add something new to my wardrobe. A couple friends have suggested Goodwill but there's not one around here and the ardor to shop will have passed by the time I get to the closest one. I learned to sew because it was required. 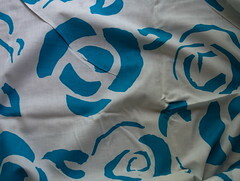 I continued to sew because I felt creative and I had clothes no one else had. I remember, in high school, going to a vocal music contest wearing a dress I made. While passing through the halls on my way to rehearsal prior to our going into competition, I ran into a gal with the same pattern. We stopped, looked at each other and laughed. My dress was a light green and white plaid. Hers was a light slate blue with flowers. While it was the same pattern, it was a completely different dress. That's what makes sewing so great. It can be the same pattern, but it's uniquely yours. Try getting that from Target or Nordstrom's. I went to the mall to stop at the Hallmark store on my route yesterday. Macy's is showing men's shirts in vivid plum, dark teal, forest green, cream and brick red. I had to stop and look. Beautiful deep colors. Walk into the women's department and, for your wardrobe this fall we have navy blue, ivory, black and what I can only call dirty chartreuse. Men get bright. We get mush. It makes me even less inclined to consider using my hard earned dollars to augment or freshen my wardrobe. 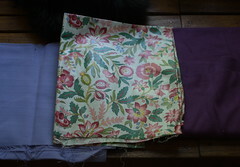 So, perhaps, once I get the "Humbug" cat banner done, it's time to scratch the sewing itch.